· Beautiful and bright 2 bedroom apartment on the top (6th) floor of an 100-year-old modernist building, renovated outside and inside. The ceilings are still the originals, with artistic moldings. There is an elevator, air conditioning ( air conditioning in the 2nd bedroom and in the living room), central heating, and a full kitchen with granite countertop, pots & pans, dishes, etc. One full bathroom with shower, toilet, sink. The living room has a dining table and chairs, a sofa, a 21-inch TV, DVDs, etc. The apartment fits up to 4, an occupancy of 3-4 would be the ideal for the size. The building's roof terrace is just upstairs from the apartment, with tables and chairs, plenty of sunshine, and views to Sagrada Familia. Please note it is a shared terrace. 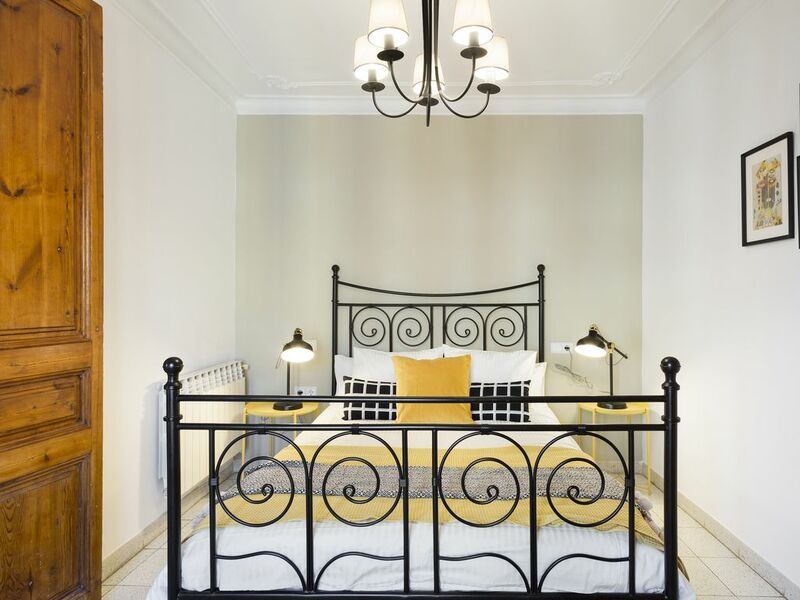 · The apartment is located in the beautiful Eixample, halfway between Gaudi's La Pedrera (also known as Casa Milà) on the Passeig de Gracia, and Gaudi's La Sagrada Familia, just a ten-minute walk from either one. Casa Amatller and Casa Batlló are at the same short distance as well. The Eixample district has the most beautiful Art Nouveau architecture in the city dating from the last half of the XIX century. There are many cafes, restaurants, tapas bars, and shops in the neighborhood also. Almost all buildings in the area are at least 100 years old. The 115-year-old Market of La Concepció, where you can do your grocery shopping in a traditional setting, is just 200 meters from the apartment. This market has fresh meat, produce, and cheeses, similar to the more famous Boqueria market, but less crowded and does not have some of the more exotic things. The Eixample is recommended as a convenient location to see the different sight around the city, but not as crowded as the Old City. You can get a taste of real local life. · There is a bus stop on the corner right by the apartment that will take you to almost all the places of interest in the city, if you don't feel like walking. The city buses are nice and modern, and run often. The apartment is also less than 5 minutes walking from the metro station of Verdaguer, on both the yellow and blue lines. One stop away is the upscale shopping street, Passeig de Gracia, though you can easily walk there from the apartment. Three stops away is Plaza Catalunya (the very center of the city and also walkable) and the start of Las Ramblas, and the beaches are just five stops away. Four stops away you have the Old Cathedral and the Picasso Museum. There is also a parking garage close to the apartment, although renting a car in Barcelona is not recommended. · We are a small family company. Lauren is from Dallas, TX and Fernando is from Barcelona, Spain. We currently run 25 holiday apartments in Barcelona, 2 in Istanbul, Turkey, and 6 in Krakow, Poland. We apply our same high standards in every country. The apartment was clean and comfortable, with enough room for 4 people. The kitchen and bathroom seemed small to us, but were average size for European cities. The hosts were welcoming and responsive, and we had no complaints while we were there. It is in a central area of the city, and a pleasant walk or short metro ride to everything that we wanted to see. It was a good value and helped us enjoy our visit. Cute, small apartment in classic Barcelona building and neighborhood. Cute, small apartment. Great neighborhood. Easy check-in and check-out. All necessities provided. Classic Barcelona building, but lobby and public areas should be better maintained. El Apartamento muy centrico, limpio y claro. The neighborhood (l'Eixample) was great and the apartment was architecturally cool, but we arrived at the end of December to find that there was no heat or hot water. The hot water was fixed within 24 hours (although the supply was adequate only for one short shower), but the heating remained a problem for the rest of the stay. Although Lauren and Fernando were very responsive initially, once it was clear that we were unhappy, communication slowed down markedly. I would not be in a hurry to stay here again. The apartment building is old and quaint. The apartment itself.was good, high ceilings, tiled floors, window shutters. Kitchen smelled damp and could.do.with a makeover but was adequate and there was everything you could.need there. Apart from.lightbulbs. they were sadly lacking! The location was perfect. Yes it was a little.noisy outside but that was part of the charm, it didn't stop me.sleeping with the window open.would definitely stay again.